They also sail from Piraeus to the ports of Aegina, Agia Marina, and Souvala. A.N.E.S - The routes of F/B PROTEYS will stop from 05/11/2018 to 03/01/2019 due to the annual inspection. The routes of F/B PROTEYS will stop from 05/11/2018 to 03/01/2019 due to the annual inspection. A.N.E.S - Itineraries of SYMI II at the route Ag. Konstantinos- North Sporades, will be served from the vessel SYMI, for the period 15/06/2018-09/09/2018. Itineraries of SYMI II at the route Ag. Konstantinos- North Sporades, will be served from the vessel SYMI, for the period 15/06/2018-09/09/2018. The vessel SYMI has a capacity of 770 passengers and 60 cars (the departure hours will remain the same). 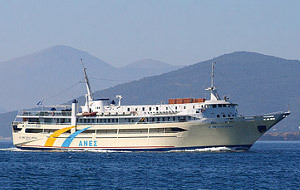 A.N.E.S - Modification of itinerary of ANES FERRIES at 27/05 from Volos to Mantoudi (Evoia). 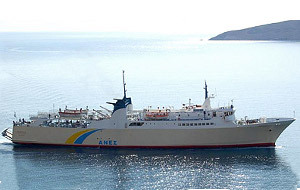 The route of ANES FERRIES at 27/05 from Volos to Mantoudi (Evoia) with vessel PROTEYS, has been modified as below: Departure from Volos at 08.00 arrival at Skiathos at 10.45. Departure from Skiathos at 11.15 arrival at Glossa at 11.45. Departure from Glossa at 12.15 arrival at Mantoudi at 13.45. Departure from Mantoudi at 16.30 arrival at Glossa at 18.00. Departure from Glossa at 18.15 arrival at Skiathos at 18.45. Departure from Skiathos at 19.15, arrival at Volos at 22.00. A.N.E.S - 25% discount for the owners of the International Student Identity Card «ISIC». ΑΝΕS FERRIES offers 25% discount to the owners of the International Student Identity Card «ISIC». The passengers should carry with them the Identity Card οn board, in case of check-in. The vessel SYMI II of ANES will also serve the route from Volos to Skiathos and Glossa Skopelou from 16/06- 10/09/2017. Η εταιρεία A.N.E.S. παρέχει έκπτωση 50% στα εισιτήρια επιστροφής των επιβατών από και προς ΠΕΙΡΑΙΑ και ΑΙΓΙΝΑ. Απαραίτητη προϋπόθεση είναι να εκδίδονται τα εισιτήρια επιστροφής ταυτόχρονα με τα εισιτήρια μετάβασης.